Thanks to the web you can instantly know what is going on in your home, your business, your child’s room, and even see how your dog is behaving no matter where you are. This remote capability is particularly the case for monitoring the temperature in your home or business. The benefits of getting this kind of data are plentiful and can prevent loss, boost profits and increase your security. Best of all, it’s easy and inexpensive to use. So what is a remote temperature monitor? How is it used, and how do you find the right one for your particular needs? In this article, I will review several types of remote temperature monitoring systems and point out the best features of each. In our latest 2018 update we are adding one additional WiFi connected device. The unit is a bit different. It is enclosed in a power plug and uses standard wall outlet to draw power. This makes the device useful where electricity is always available. The other useful (use case based) aspect is the battery. There is none. A lot of people find it tedious to change batteries. So if you are one of them you may consider this unit. What is a Remote Temperature Monitor? A remote temperature monitor is a thermometer that has been upgraded for the internet age. It’s a digital thermometer that tracks ambient changes in temperature. This sensor then streams the temperature data using wireless technology such as WiFi, Bluetooth or GSM. You receive the data via an online service to your computer or tablet, or by cellular service to your cell phone. If you have an idea about what type of device you want to buy, check out the comparison table with monitors featured in this review article. There are scores of situations that would benefit from the use of a remote temperature monitoring system. The applications listed here are brief examples, but your unique situation will provide unlimited possibilities. 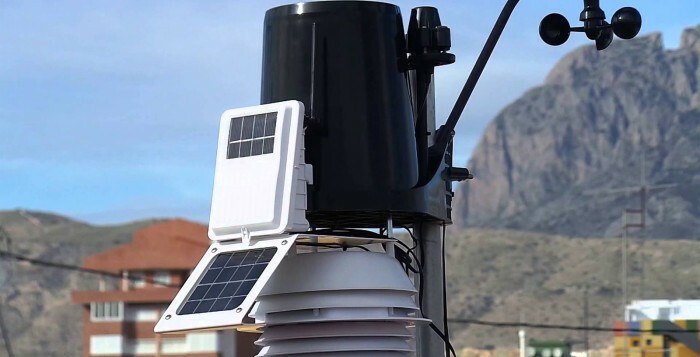 For even more information about what’s going on back home, like wind speed or rainfall, you might want to consider a full home weather station rather than just a single remote sensor. Wherever you live, whether it’s a house, apartment, RV, or even a boat, you will be able to tell at a glance what the current temperature is. Perhaps you have a vacation cottage or cabin in the mountains. With a house temperature monitor, your remote temperature sensors will let you know if it’s getting uncomfortably warm or dangerously cold in your home away from home. 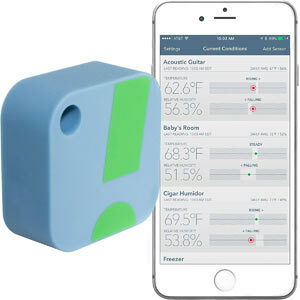 You can even monitor house temperature with an iPhone. Storage rooms house many types of temperature sensitive products and materials. 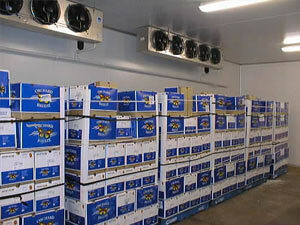 Refrigerated rooms quickly come to mind and monitoring for freezers. But, many other situations are temperature sensitive as well, such as wine cellars, drug storage rooms, greenhouses, and nurseries. Using a remote or Wi-Fi temperature sensor can protect your investments and your business. 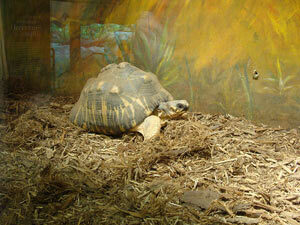 All animals are affected by changes in temperature – even your snakes, turtles and lizards! They thrive only in a very narrow degree range and need to be monitored for optimal health. The same goes for raising young chickens and other small animals. Incubating and hatching eggs is very temperature sensitive and benefits from proper monitoring. Below you’ll find reviews of the best remote temperature monitors. 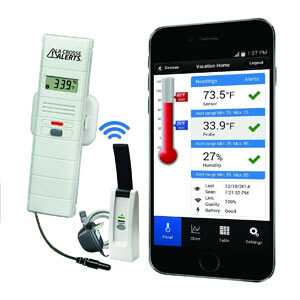 The La Crosse Alerts Mobile 926-25101 GP Wireless Monitor System remotely monitors temperature and humidity. You can watch via your smartphone, computer or tablet to keep tabs on your home, business or any place you need to track. The device comes with a six-foot dry probe for monitoring harder to reach places such as a refrigerator or freezer. The La Crosse Alerts monitors 24/7 and will send you an early warning message – text and email alerts – if either temperature or humidity levels go beyond the range that you pre-set. The system will notify you if the connection is lost or the batteries are weak. Download the system’s easy-to-use mobile app and view current readings or any data from the last 24 hours. You can download the system’s history logs as well as change your temperature alarm/alert settings any time you choose. Just connect the included Gateway to your internet router. Install batteries. Connect the included dry probe if you wish. Log in to: lacrossealertsmobile.com. Or, you can download the new La Crosse Alerts mobile app. Just sign up as a new user and follow the instructions to register your Gateway and Sensor to begin receiving temperature and humidity data. 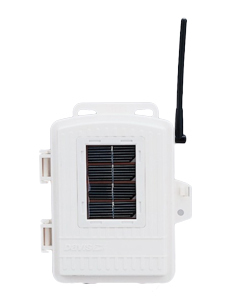 Wireless temperature and humidity sensor with a detachable 6-foot dry probe. Internet Gateway with LAN cable with AC adapter. Mobile App – download onto your smartphone or tablet. Available through Google Play, iTunes or from lacrossalertsmobile on your computer. This is a versatile system that can also accommodate additional sensors. The improved mobile app makes monitoring easy and automatic. 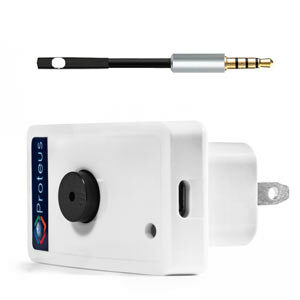 When you need to monitor multiple rooms or environments, the AcuRite 01166M 3-Sensor Indoor Temperature and Humidity Remote Monitoring System might just be a perfect choice. This monitor comes with three sensors for simultaneous tracking of temperature and humidity in several locations. The three indoor sensors provide constant monitoring with digital displays. The sensors are free standing for tabletop use, and they are easy to wall mount with an integrated keyhole. You can easily label each location you are monitoring such as living room or bedroom, to distinguish sites at a glance. The system features custom text and email alerts. Set your parameters for high or low temperatures and humidity and be informed automatically. Get a notification before your property or valuables get damaged. 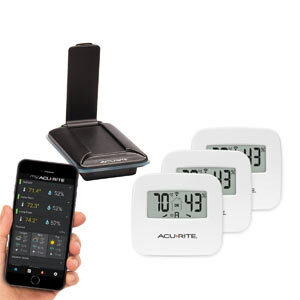 With the My AcuRite platform, you can have a remote temperature monitor with your iPhone or Android smartphone, iPad or Android tablet, or through a web enabled browser. Follow Trends The system creates charts and graphs of all received data. Gauge temperature/humidity level changes throughout the day. Use this information to set or dial in the most energy-efficient settings for your home’s heating and cooling systems. The MyAcuRite has a smartHUB that receives data from as many as ten wireless sensors. The system is customizable, so you can change the configuration as your needs change. For instance, it can monitor water leaks or track liquid or soil temperatures. 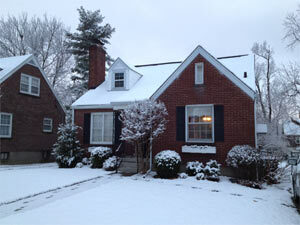 This can be a lifesaver in cold weather climates where frozen pipes are susceptible to bursting. The Digital Room Sensor display also uses easy-to-see trend arrows. In an instant, know if the temperature or humidity levels are rising, falling or holding. The Room Sensor has multiple mounting options – use on a tabletop or easily mount on a wall. This is a versatile and customizable Room Sensor that tracks multiple locations and provides lots of data options for watching trends. Use in child room/room/storage room. If you’re looking for a compact and smartly designed sensor, consider the SensorPush Wireless Thermometer / Hygrometer. It measures a tiny 1.57 x 1.57 x .65 inches but packs many of the same features of the larger monitors. Despite its small size, the SensorPush is accurate, featuring a Swiss-made sensing component. The unit is easy to set up with the free app for iOS 8+ or Android 4.3+. Just hold the sensor against the screen to adjust the unit. The line of sight range of 325 feet can even detect data clear across your home. Once you set it up, this monitor will transmit its readings to your devices via Bluetooth. A SensorPush G1 WiFi Gateway device is needed to send data and alerts over the Internet. If you appreciate lots of data and many ways to crunch that data, then you won’t be disappointed with the SensorPush. The sensor will hold over 20 days of data which is transmitted to any paired phone via Bluetooth when within range. The monitor takes readings every minute, logging them with a time stamp. It displays the data on a digital graph by the hour, day, month and year. You can also export the raw data as a .csv file. The data imports into an Excel spreadsheet. Now you can sort and filter your readings every possible way for maximum usage. SensorPush guarantees their compact product for two months. If you’re not satisfied, they will fix it, or you can return it, no questions asked. Reviewers raved about this sensor for its accuracy and dependability. Also of note, there was impressive feedback regarding the company’s service. One reviewer noted the company responded to his email request in just ten minutes! Looking for a small, simple to use monitor for your server room? Then check out the [email protected] USB Edition. 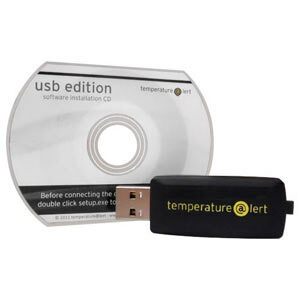 This is a temperature monitor encased on a USB stick. The tiny unit plugs right into your computer’s USB port and runs on Windows. It never needs batteries or AC as it uses the computer’s power. 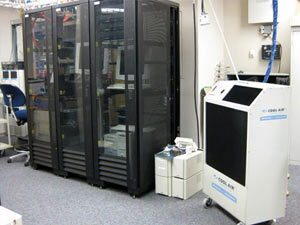 The monitor sits in your server room and tracks temperatures from 00 C to +600C. It’s accurate to within ±0.5°C. You can customize your alert message, which can be sent as a one-time warning, or transmitted to you continuously. Alerts are sent via email should the temperature rise to unacceptable levels. The data from the [email protected] can be configured into real-time graphing and provides XML support. You can import a temperature reading/thermal reading into either text or XML files. These files can be quickly integrated into custom applications for further analysis. For instance, you can import temperature readings into websites. Temperature readings can be done in either Celsius or Fahrenheit. The included software comes on a CD-ROM and includes a Quick Start Guide. There are no monthly fees. However, there is an optional Sensor Cloud service which facilitates online viewing and smartphone apps. The log alerts will record on your PC’s event log. Also featured is an optional PC shutdown. Can send alerts to several email addresses. Runs on Windows 2000, XP, 2003 Server, Vista & and 2008 Server. The package includes Free Software Upgrades for one year. 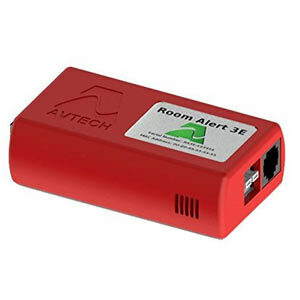 The AVETECH Room Alert 3E is an economical answer for IT & Facilities Monitoring. It is also compact, so if you don’t have a lot of space in your facility for a temperature monitor, this unit will fit nicely. It is also perfect for rooms where there may not be easy access to power, as the unit can be powered from the ethernet. The AVETECH features an Ethernet “Plug & Play” setup for quick and easy IT facilities temperature tracking. The built-in sensor shows digital temperature readings. The unit comes with ManageR software and offers “Push” technology. If you are interested in a Light Tower & Relay Adapter (LTA), this unit provides one at a most economical cost. With the LTA you can connect an AVTECH Light Tower, Light Tower w/Audio or Relay Switch Sensor. Also built in is Power over Ethernet (PoE), a 5-volt power adapter. The package includes the “GoToMy Device Cloud Service,” for reliable delivery of your temperate data. The device includes ports for a digital sensor or Light Tower & Relay Adapter. Also featured is Advanced alerting by email, email-to-SMS, and SNMP. Also, the unit features web page update. AVTECH Software Inc. (AVTECH) warrants its Room Alert environment monitors against defects in materials and workmanship under normal use for one (1) year from the date of purchase (‘Warranty Period’) by the original end user customer. Don’t have an internet connection or a phone line? 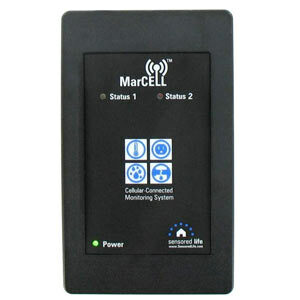 The answer for you is the MarCELL Cellular Connected Monitoring System. This easy to set up monitoring system is up and running in about 15 minutes. Here’s how it works: the system communicates with Verizon cell towers, one of the largest mobile networks. Cellular systems have proven to be more reliable and secure than devices connected to WiFi. The device comes with a lithium battery, so it will work during a power outage. The MarCell has an internal modem so that it doesn’t conflict with your personal cell service. The Monitoring System will alert you via text, email or even call if there is a temperature spike, extreme humidity, a power outage and when your power is restored. You’ll have peace of mind knowing if anything goes wrong, you’ll be notified. Though it is based on a cellular network, the monitor communicates with an internet cloud application. It communicates directly to your computer, tablet or smartphone. The system sends sensitive data three to four times an hour to your cloud account. You can add optional sensors to the MarCELL Cellular Monitoring System. The sensors add multiple zones and range of up to 200 feet. The sensors can monitor for water leaks and even flooding. They are small and battery powered so can be placed behind toilets, under sinks and near to sump pumps or hot water heaters. Multiple Low-Cost Subscription Monitoring Plans The annual plan is only $8.25 per month. If you only want to pay for selected months, then the rate is $11.95 per month. You can select a range of four to eight months on this plan. There is also a month-to-month plan at $14.95 per months. The Temp° Stick is a versatile all-in-one wireless sensor for monitoring temperature and humidity for your home or business. The system features monitoring with wifi. Just connect the system directly to your network – no gateway devices are required. This system will also alert multiple users. This is not only convenient but also a failsafe backup should any one user miss an alert. The sensor will immediately alert you if there are extreme changes in temperature, humidity, if a connection is lost or if batteries are getting low. It sends text and email alerts. The unit is battery operated so that it will function anywhere. You can view and manage its operations from your smartphone, tablet or PC. The system will track temperature of -40°F to 125°F and humidity from 0 – 100%. You can set hi-lo triggers to alert you should something go amiss. Plus you can customize your alert messages. The Temp° Stick records an unlimited history of sensor readings. This is ideal for crunching data and watching for overall patterns. You can set the frequency of readings from 1 to 12 times every hour. There are no fees or subscriptions, and free Android and iPhone mobile apps are available. Readings can be in Celsius or Fahrenheit. The system comes with a money-back guarantee. Reviewers were impressed with the ease of the app interface and that the system doesn’t require any subscription. There was also solid feedback about the customizable alerts and excellent customer service and support. 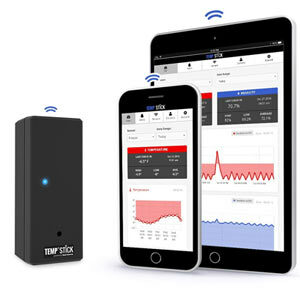 If you’re looking to monitor much more than just temperature and humidity, check out the ConnectSense CS-TH Wireless Temperature and Humidity Sensor. From the living room to server room, from the basement to the greenhouse, this system features an array of sensors to monitor anything that might go wrong. This is an easy to connect, easy to use system with a host of options to monitor multiple functions. You get to program the system by creating simple ‘rules’ for your alerts. The sensors are wireless and quickly set up. As with other systems, the ConnectSense features a temperature and humidity sensor. You can just as easily monitor a server room as a wine cellar or valuable books, art, even cigars – anything that is affected by temperature or humidity. The system quickly sets up using your existing WiFi network. You set up the contact rules and receive messages and alerts via phone, text message, email, and Twitter. The ConnectSense cloud receives data from the sensors and can be accessed anywhere, on any device with a web browser. This cloud-based infrastructure is reliable and notifies you instantly should anything go wrong. Also, there are no monthly fees! The ConnectSense software incorporates a ‘rules engine,’ so you can create if/then-based rules for your sensor. This provides maximum versatility to monitor all conditions. Unlike other sensors that require gateways and can fail, no additional hardware is required. The device can be powered by 2500mAh rechargeable batteries, so you don’t need an AC connection. Install the sensors anywhere, even in your motor home. ConnectSense offers a complete line of sensors to monitor temperature and humidity, plus you can also monitor for water, motion, security door/window, dry contacts, and light. This system offers complete coverage! The ConnectSense is more than just a collection of sensors for monitoring your home or business. The system also features power output modules, which can take the alerting data and create actions based on rules you’ve programmed. Just add these output modules to your account, and they can work with any of your sensors. If an alert occurs, the module will function according to the rules you’ve set up. For instance, a temperature sensor in Los Angeles can trigger a siren in New York. 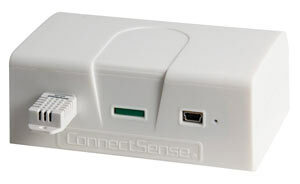 ConnectSense offers a variety of outputs including a siren/strobe, digital output, and power relay. Reviewers report that setup and installation only take about 1 – 15 minutes. They also like the versatility of creating their own reporting rules and that they are easy to use. Proteus AMBIO WiFi Temperature Humidity sensors is easy to use device suitable many applications. From storage and refrigerator monitoring to remote home and server room. The device draw its power from standard 120-240 AC outlet. Just plug it in and you are good to go. AMBIO uses a cable style probe to record the ambient data. The cord is 3 inch long. If you find this on the short side you can get and extension that goes between the base unit and the probe. According to the specification the device works in the range of –10 to 85 °C (-14 to 185 °F) with ~0.5°C accuracy. It can go up to 125C or 257°F. Setting it up is pretty straightforward. Set your WiFi, open your phone and visit the manufacturer’s site and login with user name and password. Connect the device, let it pare and you are set. The device creates its own WiFi network for initial setup. When inside your on-line account you will have the option to set all the the necessary thresholds and alarms. Temperature and humidity readout are also available there. Proteus gives you two notifications options – email and text message to your smartphone. Another useful feature is the ability to use more than one email address and cellphone number for each active sensor. In time of power outage (when the sensor stops reporting) you will receive text or email notification. Besides all remote alarms there is local in-unit buzzer the will be set off when some threshold is met. The duration of buzzer alarm can also change. We all appreciate the security of knowing our valuables, our property, our pets or our business are protected and secure. Nothing is worse than coming home to a broken pipe, or worse, an animal in distress. But if you’re not home or away for an extended period, nature, equipment failure or accidents can create havoc for the things you care about. Nothing takes the place of being able to access vital data about your home or business when you can’t be there. Here are factors to consider when shopping for your remote sensing monitor system. The models listed here all send critical alert data to your connected web device – smartphone, tablet or computer. Most use a 433mhz remote temperature sensor system. Some send regular readings continuously like the SensorPush Wireless Thermometer / Hygrometer, which takes readings every minute, logging them with a time stamp. All the units instantly send alerts should something go awry. Unlike the others, the MarCELL Cellular Connected Monitoring System sends data using a cellular system, not relying on local WiFi. Some units like the AVTECH send SMS/text alerts, and the ConnectSense CS-TH can even alert you on Twitter. The SensorPush comes with a free app for your smartphone iOS 8+ or Android 4.3+. All the units have the capability to collect temperature and humidity data. Also, some like the ConnectSense monitor for water leaks, motion, security door/window, dry contacts and even light. Some models allow for the addition of extra sensors such as the La Cross Alerts Mobile, and the AcuRite 01166M 3-Sensor Monitoring System can accommodate as many as ten extra sensors. The SensorPush can export its data to .csv files so you can import the information into an Excel spreadsheet for further study and evaluation. Other models like the La Cross Alerts Mobile and the Temp° Stick collect unlimited historical data. Also, the AcuRite 01166M creates charts and graphs of all received data. The [email protected] USB Edition exports its data into custom applications for further analysis. Some models such as the Temp° Stick run on battery power. Two exceptions – the [email protected] USB Edition plugs into your computer’s USB port and uses the computer’s power – no other power source is needed. And, the AVETECH Room Alert 3E features a power over Ethernet (PoE). Our most economical model, the La Crosse Alerts Mobile 926-25101 GP will only set you back $29. On the other end of the spectrum, the MarCELL Cellular Monitoring System comes to $179 but includes features such as an internal modem and multiple zone sensors which have a range of up to 200 feet. Warranties also vary with the SensorPush offering a no questions asked two-month warranty, to the AVTECH’s full one year warranty. Just a few years ago it would have been impossible or extremely costly to monitor conditions like these in your home or business. Now in 2017, thanks to the web, WiFi, cellular networks and the internet of everything, you can be your own monitoring station, knowing instantly if something has gone wrong, even if you are thousands of miles away. It’s a new networking age helping to ensure peace of mind and security for the important things, people, and valuables in your life. 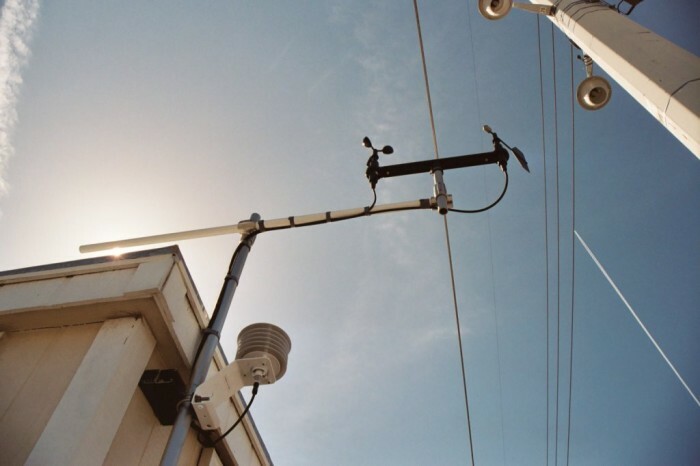 Weather stations range from simple one sensor devices to multisensory devices with soil temperature and radiation sensor. With so many different models on the market and so many different prices options, it might feel like an impossible task to choose the right one. So we are going to outline a couple of important features and then you have to decide which one is more important to you. 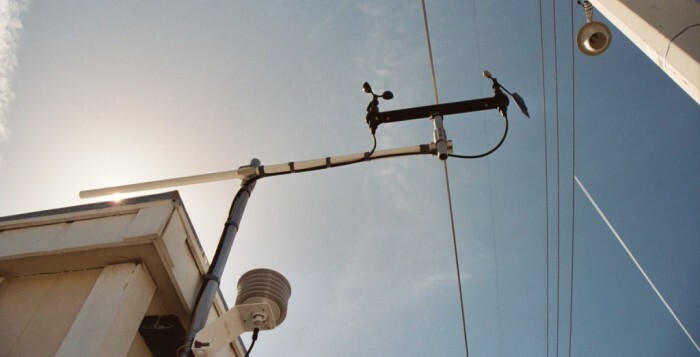 Remember the more money you spend the more reliable and accurate are the weather instruments are, and less money you spend, you are leaning toward residential type devices with less accuracy and sensors. Temperature and humidity sensors are housed inside. This shield protects these two sensors from the direct sunlight and thus enable them to give more precise measurements. Some PWS have a fan aspirator inside the shield; this can prevents hot air bubbles to disrupt the sensor’s work. Look for: Large radiation shields; If possible chose the one that has fan. 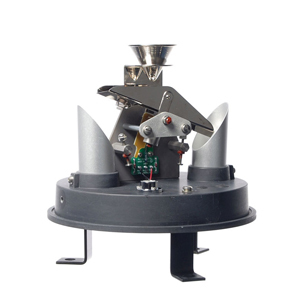 There are two types of anemometers propeller and spinning cups and there is not much of a difference which one you’ll get. 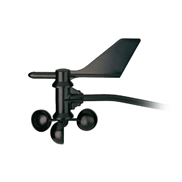 But because anemometers can cache ice in cold humid weather, try to choose a black colored sensor to reduce the time the ice stays on. The accuracy is the most important feature to look for when deciding what type to get. When choosing your weather instrument check out the specification and look for accuracy range of ± 5% or better. Look for: Black color; Accuracy in the range of ± 5% or better. Rain gauge is for measuring rain fall or liquid precipitation. In general the tech behind the rain gauge is fairly simple – the rain water fills up one side of the double- sided bucket (tipping bucket) and when the volume reaches certain point the gravity causes the bucket to tilt and drain, in the same time the other side lifts up and the second bucker start to fill. Here a good rule is to avoid small buckets – the wider and taller the bucket – the more accurate the measurement will be. Avoid shallow funnels because in heavy rainfall it may fill and start to overflow. Another problem with the shallow funnels is the – “splash out” – heavy raindrops will hits the funnel and escape the collection area. Another important feature of the rain gauge is the data resolution. This is the volume of rain the tipping bucket has to collect before it pivots to the side. Look for one-hundredth of an inch (0.01) when checking the device specification. 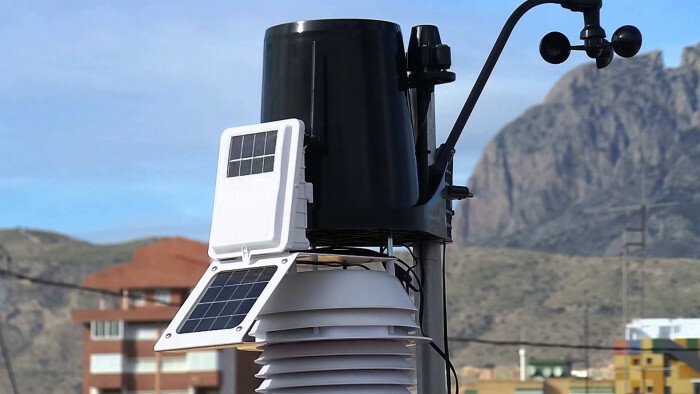 Weather stations measures dewpoint based on temperature and relative humidity. However some sensors on the market a prone to errors with restricted operation rage. Look for: PWS with Relative Humidity in the rage of 0-100%, with data resolution of at least 1%, and accuracy rating ±3%. If you don’t want to extend bunch of cables the wireless technology can take care of it. Most home weather measuring devices are equipped or exclusively transmit their data trough Wi-Fi. Look for: Longer range of transmission. Around 250 feet is good starting point. The on-board solar power system means minimal power maintenance trips after installation. The panel gives energy to the sensor unit during the course of the day and the power capacitor provides the power at night time. Look for: Larger solar panel. 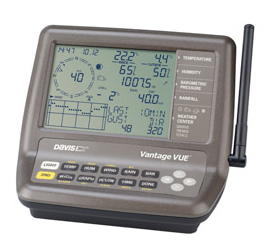 The digital console is the device that provides readouts of the weather variables being collected. Depending on the model, the console will give all kinds of information like – historic weather data, highest wind gusts, forecast, atomic time and many others. If you want to store the data on your PC or publish it online some of the consoles have that interface. Most of the weather stations include their barometric pressure inside the console unit. The consoles constantly check the barometric pressure, they then use the collected data to show you what the weather is doing be. Most of the displays present the forecast with easy to follow graphic symbols such as clouds and rain. The arrow indicates the current barometric trend, measured over the last couple hours. It is updated on some period of time depending on the model and brand. Barometric pressure changes with local weather. This arrow is good indicator of what the weather is going to be in the next few hours. Rising pressure means fair weather while falling pressure means poor weather. The graph will give you historic data from the station’s sensors. Useful feature if you don’t want to connect to a computer but want to check your historic data in more convenient way. Rain rate the intensity of rainfall. It is measured by calculating the amount of rain that falls into the bucket per unit of time. On the console the rain rate is displayed as either inches per hour (in/hr.) or millimeters per hour (mm/hr.). The solar radiation number on the display console is a measurment of the amount of solar radiation colliding with solar radiation sensor at any given time, The unit that measures this interaction is expressed in Watts/. Some of the more high-end devices have this reading. You will need a sensor to have this reading on your console. This will display changing levels of UV radiation. If you have backyard and you are doing a sunbaths this can alert of situations where exposures to the sun is particularly unacceptable. The UV radiation readout requires the UV radiation sensor. This reading gives you information of how hot the air actually “feels”. It is a calculation between temperature and relative humidity. When the humidity is higher the temperature you “feel” is lower than the actual air temperature. When there are more water droplets in the air i.e. higher humidity the apparent temperature will be higher. This measures how the wind speed will affect your perception of the air temp. The faster the wind the higher the wind chill effect, the colder you get. The console weather forecast is generated based on set of variables reported by your sensor suite. The data variables taken into account are – barometric reading & trend, wind speed & direction, rainfall, temperature, humidity, latitude & longitude, and time of year. 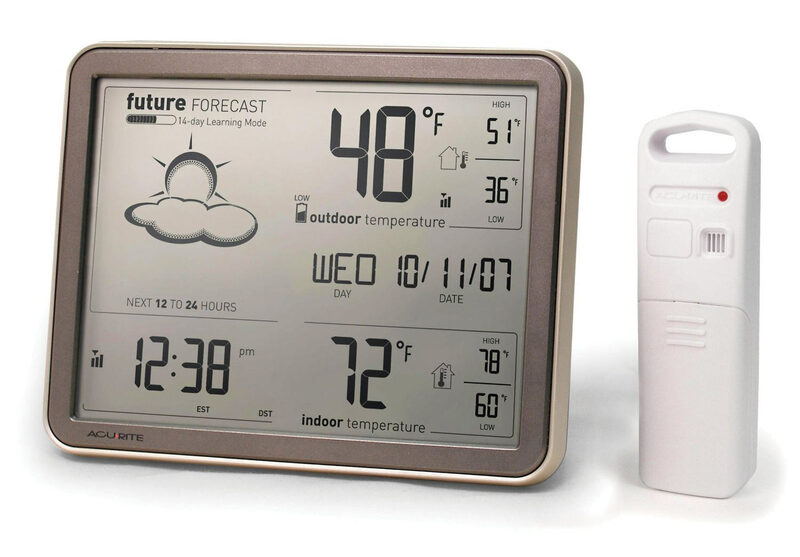 Most of the weather devices use forecast icons to present the predicted weather for the next 24 hours. Represents the current Moon phase of the based on your current Hemisphere. Some console receivers are equipped with RCC atomic clock which is synced with National Institute of Standard and Technologies that makes sure the clock is always accurate as possible. The console uses the current time and date combined with your latitude and longitude to calculate the sunrise and sunset. 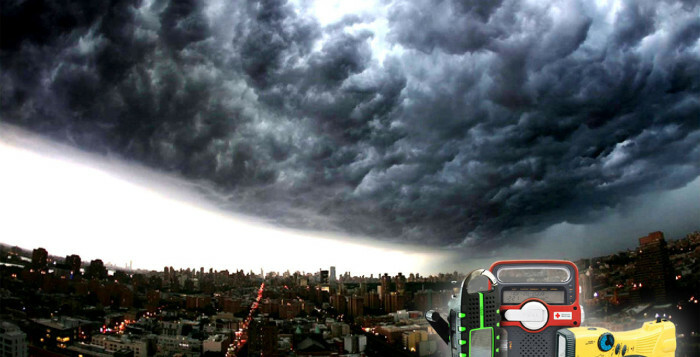 Emergency weather radio is an essential part of any emergency kit. Its main purpose is the keep you informed by getting first hand information from the authorities. This will give you extra time to prepare and evacuate. The emergency radio receives not only weather related data (from weather stations around the country), but other emergency broadcast such as natural disasters, chemical warnings and AMBER alerts. The device broadcasts on VHF (Very High Frequency) with frequency modulation (FM). All the disaster alerts are broadcasted by the National Oceanic and Atmospheric Administration (NOAA) on frequencies from 162.400 MHz to 162.550 MHz. These national weather alerts are not available on a simple AM/FM radio receiver.A compariosn table of all the models reviewd in this article. For more detailed info please scroll down. What features to look for when choosing emergency receiver? When looking for the best emergency radio you will stumble across many different model, brand, sizes and features, but there is couple of things, you need to look for when buying one. Crank power – helpful when you don’t have additional powering sources and your batteries are exhausted. Multiple power sources – In general, keep an eye for multiple power sources like external AC power, batteries, and hand-crank or other type of charging method. All of the radios in our list are equipped with at least three power sources. NOAA or Public Alert – with these features you can be sure your radio meets specific tech standards. So be sure to check if they are available before buying one. SAME technology – Because NOAA alerts are country or city based with this technology you can make sure the disasters you are notified are for the areas you have selected. Phone charger – useful for satiations when your phone has died and you need to make an emergency call; be sure to check cable computability with your mobile device. For us choosing the best emergency radio comes down to these couple of features. So with these criteria in mind let’s take a look at couple of emergency receivers you can get online. Note: If you want to charge you phone on go, and you are not interested in emergency radio the prefect solution is the high capacity power bank. These are five emergency weather radios that have phone charger and are good all-around models and will probably be helpful to you and your family in difficult times. Kaito KA332W is a 5-way powered emergency radio that is designed for both daily use and emergency situations. The five main powers sources will keep you charged and ready at any given times. As a major energy source Kaito used a rechargeable battery with a capacity of 3.7V / 500mAh. It uses DC 5V USB port as phone charger and alternative power source. It is equipped with a small solar panel – underneath extendable antenna – designed to power the radio or as extra energy to internal NiMH battery. The panel is very sensitive and is able to capture even small quantities of solar energy. In addition to the solar panel, dynamo generator can be used as a backup for the receiver or to power the NiMH battery. The radio uses two main modulations AM and FM can operate as normal radio or receive all 7 NOAA weather channels. The unit is small and compact and build quality seems good. It would be better if it was waterproof, but the radio is small enough to fit in a small waterproof bag or in a pocket of your backpack. The crank is easy to use and the handle is with the necessary length. In cases when you are not using the crank it can be tucked underneath device. The sound quality is not as good as one my want, but it is acceptable enough to understand the important news or the transmitted NOAA messages. If the quality of the speaker bothers you much, you can always use earphones (included) to improve it. Flashlight uses three light-emitting diodes and running without any problems. Overall – a good quality radio, compact and with enough features to serve you well for years. 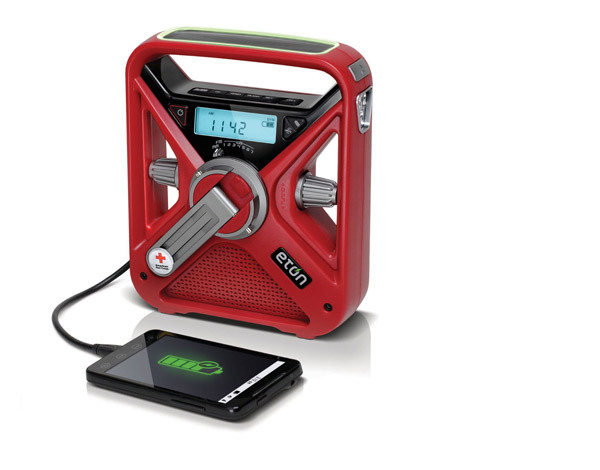 The FRX3 is stylish emergency weather radio produced by the U.S. based company Eton for their lineup of products targeted toward preparedness-oriented situations. This radio comes with a couple of different powering options such as: the solar panel – which takes up to 10 hours to power the NiMH battery; the hand crank which can charges the build in NiMH batteries and give you from 5 to 7 minutes radio for 90 seconds of spinning; the 3 AAA batteries are not included but can give you additional power when it’s needed and finally the standard DC power adapter. 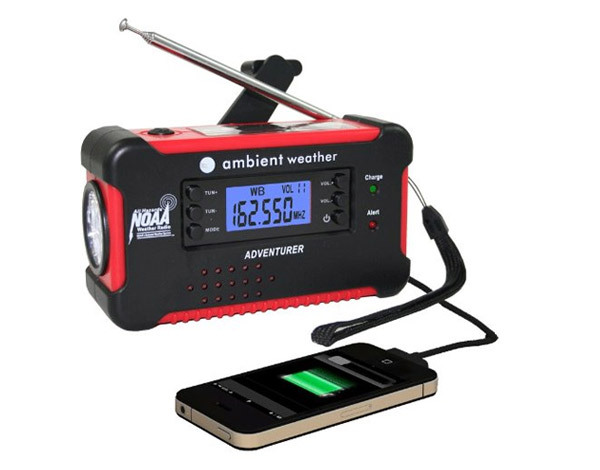 This weather alert device comes with all seven NOAA weather channels and digital tuning AM/FM radio. A nice feature to the radio is a knob that you can use to tune the radio (AM/FM/VHF weather), in addition to the up and down standard buttons. The receiving antenna is telescopic and not used can be retracted nicely on the back side. FRX3 comes with quality crank and when used it’s very easy to turn and you won’t be tiered even after 10 minutes of turning. One downside of this radio is probably the flash light (2 LEDs) which a little bit weak but never the less serves the purpose of additional emergency light source. Below the flash light there is a blinking red light that can come in handy when you want to attract someone’s attentions. The feature that shines in FRX 3 is the phone charger and in particular the dump function. With this function the device transfers the charge form the NiMH battery to you mobile phone – a useful option for emergency situations. 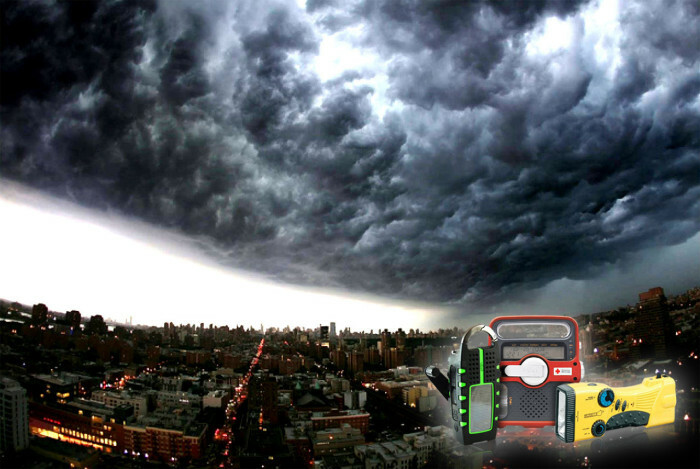 Overall a quality emergency weather radio with lots of powering options. This little brother of FRX3 is a small compact weather emergency radio that has nearly all the features as his big brother with exception of the AAA batteries powering option. The small size makes this device a useful tool for hiking, camping and other outdoor activities. It is useful in emergency outdoor cases such as: charging your cell phone, GPS and other electronics. This tool is good addition to the standard emergency toolkit. On the top of the radio we can find the solar panel and the button to turn one the LED light. It conations three different and if you long press the button the lights will stay on. 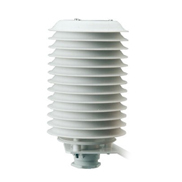 FR160 has an extending antenna that can be pull out to improve the reception of the AM/FM/VHF radio transmitter. On the side we find the headphone socket and the USB sport, so you can charge your phone. At the back of the radio is the crank. As with the previous Eton model manually turning the crank for about 5 min minutes will result in 15 minutes of low volume play. The solar panel is identical with the FXR3 model and 10 to 12 hours of direct sunlight will give you around 3 to 4 hours of radio play. The radio has no digital display and is operated by the 2 knows on the front side – tuning and volume. There is horizontal slider which you can use to switch between the 7 available NOAA weather bands. It lacks some of the FRX3 model’s functions but considering its size, that isn’t a down side. Overall a really great item and we encourage you to consider it for your emergency kits or vehicles. 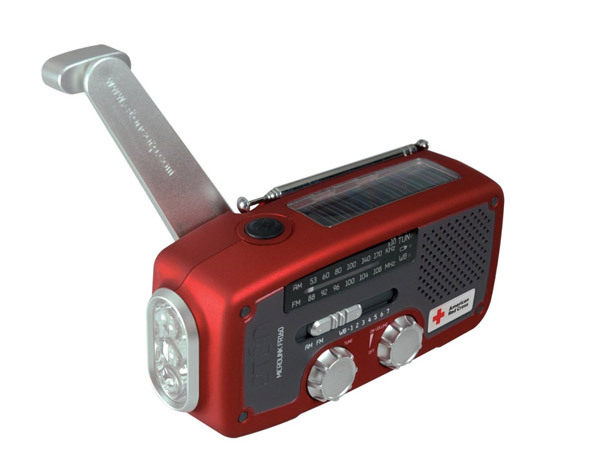 The radio contains a flash light, phone charger, solar panel, and AM/FM/NOAA radio receiver. Epica weather radio can be recharged 3 ways. You can use the hand crank to crank it the build in solar panel or you can use the USB connection to charge it trough computer or with DC adaptor. The box contains 3 connectors. There are mini USB and micro USB and iPhone adapters that plug in one single connector to charge your phone. The radio has second separate cable that can be used to charge the build-in battery. You will need around two hours to get your device fully recharged. The multiband tuner allows you to reach AM and FM stations and 7 NOAA national weather stations. The radio has a digital display to show you the current station. You can use the buttons on the top to change the frequency and the band you are set to like AM, FM or weather channel. The radio has a scan functions which is accessible trough long pushing one of the seek buttons. One minute of cranking will provide 30 minutes of LED flashlight or 20 min. of radio power. Which is pretty good result. The phone charger takes power from the internal battery and when you use it you don’t want to crank the crank. You should spin the crank charge the battery a bit and then plug in your phone and get e brief charge to make emergency phone calls. The flash light consists of 3 LEDs. It is not something special that you can use for long term exploring but it may come in handy. The radio is water resistant but not water proofed. So it probably will stand up to a rain but not a drop in the water, keep that in mind when using it. There is also a plastic carabineer you can tie to string or a rope and hand t on a tent or backpack, but it looks little flimsy and it’s plastic and it has a good chance to easily brake off. WR-111B is pretty decent looking radio with red and black design and nice small size that can fit in the palm of your hand. 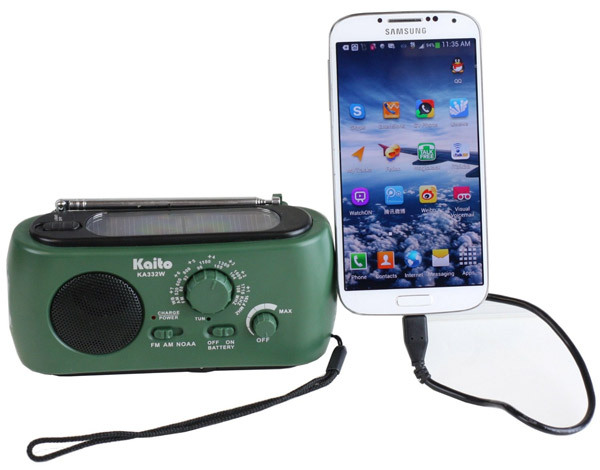 Genera features of this radio are: AM/FM NOAA weather, flash light, solar panel, charging hand crank, and cell phone charger. Lots of stuff packed in this little radio that can come handy in case of emergency. On the back there’s a hand crank with recommended two times a second spinning ratio. If the battery is dead you have to do the spinning for about 2 or 3 minutes and after that one minute of cranking will give you about 50 minutes of radio time. The battery is bellow the crank and it is a single CR123A rechargeable battery. If for some reason you need to replace it you can do that quite easily. The manufacturer recommends that you remove the battery if you going to store the device for a long time. Also in the back is the antenna that sticks out about two feet for a better reception. On the top you will find the solar power panel and the flashlight button. The solar power charger is a battery life extender and cannot fully charge the battery. 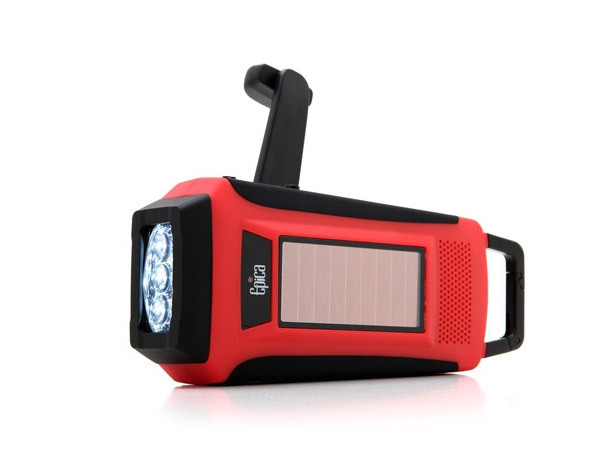 The flashlight is 3 LED flash light that is not super bright but if you are in a blackout this will help you with some basic tasks around the house. On the back is where you can charge either the radio itself or some other devices. The rubber peace lifts up and you will find the headset jack, the cell phone charger and the radio charger. The radio comes with several cords and adapter chargers – micro USB, mini USB, and Apple connector. The cell phone charger works decently well and you will have no problem using it. It will not charge you phone fully but it will be helpful for short emergency phone calls. Moving on to the radio options, this device has the standard package that includes – NOAA and AM/FM radio bands. There are 7 channels of NOAA weather radio and you can cycle trough them with convenient button on the front side of the panel. This model also has a weather alert option such that if there is an emergency this mode will continuously scan the weather band and if there is an emergency the radio will turn on and alert you to that. It is recommended while in this mode to plug the USB in external powering source to keep the battery alive. Overall this is a great radio for putting either in your bug out bag your get home bag or just keeping around the house. Or if there’s a blackout or some type of weather emergency that you’re just you need to keep track of. In this short guide we tried to gather the maximum amount of useful information for several indoor-outdoor thermometers and weather stations that are suitable for people living in urban/residential areas. We have distant our self from the higher class weather stations that need more space and time to assemble. Have you ever wondered why the local weather report was predicting sunny and calm weather, and rain was knocking on your window. The main reason for that is that weather updates depend heavily on location and equipment. That’s why the meteorological conditions in your area can be quite different from the one presented in your local weather report.